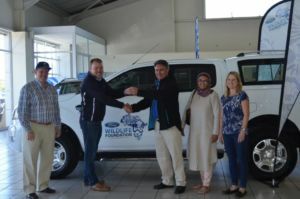 Friday, 5 April 2019 – The Ford Wildlife Foundation (FWF) has donated a new Ford Ranger to the Southern African Foundation for the Conservation of Coastal Birds (SANCCOB) in Cape Town to assist the organisation in its efforts to rescue orphaned or injured seabirds such as the endangered African penguin, Cape gannet, Cape cormorant and Bank cormorant. SANCCOB has been rescuing seabirds for 50 years, with close to 100 000 birds and penguins treated since it was founded in 1968. Once the penguins are rehabilitated and healthy, they are released at one of the two only mainland breeding colonies in South Africa, located in Simon’s Town and Stony Point near Betty’s Bay in the Western Cape. The organisation also supports the conservation work of the penguin and seabird rangers at these two colonies, so that rehabilitated birds find a support environment upon release. In August 2018, SANCCOB appointed a new penguin and seabird ranger on Robben Island. The objective is to rescue injured, oiled or abandoned penguins and seabirds, conduct moult counts of African penguins, maintain infrastructure, equipment, and the natural vegetation at the colony, and assist with the monitoring of seabirds, data collection and other research led by the SANCCOB Research Manager. SANCCOB’s research team provides data on the status of Southern African seabirds admitted for rehabilitation – providing valuable information on the occurrence of oiled birds, entangled birds in fishing gear, birds affected by pollution, as well as other threats impacting on the survival of seabirds. This data is shared with researchers and government organisations and, importantly, used in conservation planning. The organisation also hosts education programmes for children and adults, as well as training, internships and exchange programmes for zoo and aquarium keepers, and veterinary experience courses. Along with SANCCOB’s main facility in Table View, Cape Town, it also runs a rescue and rehabilitation centre in the Cape Recife Nature Reserve in Port Elizabeth. For over 30 years, Ford Motor Company of Southern Africa (FMCSA) has been actively involved in the conservation of wildlife and ecosystems in South Africa and Sub-Saharan Africa. To date, FMCSA has invested almost R40 million to support more than 170 conservation projects. The Ford Wildlife Foundation is unique as it does not provide a cash donation to the conservation projects it supports, instead Ford’s partner organisations are equipped with Ford Rangers. The vehicles provided are used to help project operations, such as transporting field equipment, helping vets reach sick or poached animals, or translocating the animals themselves. The vehicles operating in all Ford Wildlife Foundation projects are monitored and serviced by Ford’s extensive dealer network to ensure they operate at peak efficiency.